From dropbears to witches to spiders, there's a ton of fright packed into these twelve short stories. Arachnophobia scared me the most out of all of them... If I have nightmares tonight, I'm blaming Dewar! This collection of short stories offers a little of every kind of fright, wrapped in a light-hearted tone, each story mixed with a pinch of irony. I bought this for my 10 year old daughter six months ago. She read half of the first story, said she like it and promptly got distracted by something else. Halloween inspired her to pick it up again. This time she finished all the stories in a day. Nightmare Stories by Matthew Dewar is a delight for both children and adults alike. Chockful of both humor and scares, the stories are short and perfect for campfires or sleepovers or fans of the Goosebumps series. From a spooky prison to Santa’s workshop and unending nightmares or a zombie infested theme park, there’s something for everyone here. Highly recommend! This is a very fun read for anyone who enjoys a little humor dashed over their "creepy". Matthew has such a talent for writing visuals that the reader really feels like they're swimming around in the coral reef or being hunted by drop bears or my favorite, being stalked by zombies through an amazement park. It may sound cliché, but it doesn't matter if you're ten years old or a hundred and ten, you will enjoy this collection. I can't wait to see what's next from this author. Dewar knocked it out of the park with this one. 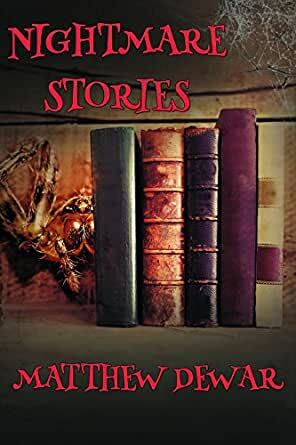 This is a solid anthology of horror stories, suitable for all ages, provided you like a good scare! If you enjoy 'Goosebumps,' or 'Scary Stories to Tell in the Dark' then this is right up your alley.